This is the closest I could get, and my only try. You can’t see the band either, so I guess it’s a “fail”. The photo is composed by two images, hand held, taken with high speed bracketing. Some movement can be seen. I’ll try to make a tone mapped photo of an artist on stage this summer. I’m not a big fan of “HDR” and tone mapping, especially if you can see tone mapping has been used. You should read the article Cooking Vegetables by Mike Johnston. Later I will post another “cheat”, a composite concert photo to show greater DOF. 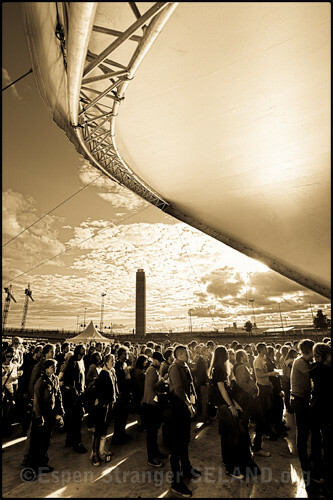 This entry was posted in Music, Photography and tagged concert, Elephant9, Øyafestivalen, technique on 2009-05-20 by Espen Stranger Seland.